The official birthstone of March, aquamarine can be the perfect engagement ring gem choice for any springtime bride, or any woman who loves the gemstone's pale blue hue. Calm and cooling in their icy blue coloring, aquamarine engagement rings evoke the constancy and dependability of ocean tides. What better way to show your enduring love for her than to ask for her hand in marriage with an aquamarine engagement ring? Diamond accents bow in deference to this vintage engagement ring's aquamarine. 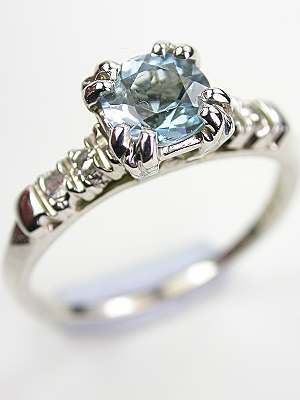 The diamonds of this vintage ring slink down the shoulders, allowing the split prong set aquamarine the center stage. A sleek polished band provides an understated backdrop. Details: Vintage. Circa 1940 or later. 14k white gold. Round single cut diamonds; 0.06 carats. Round cut aquamarine; 0.58 carats. 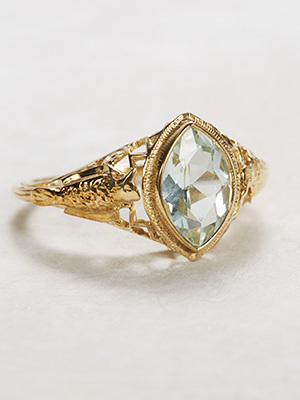 A pale round aquamarine rises out of this antique engagement ring, bathing the finger in a soft glow. An aquamarine is set in a platinum coronet shank. Six old style full cut diamonds cascade down the shoulders of the platinum band, lending the illusion of drizzling dew drops to this antique engagement ring. Details: Platinum. Old style full cut diamonds; 0.19 carats. Round aquamarine; 2.06 carats. Antique, Circa 1925. 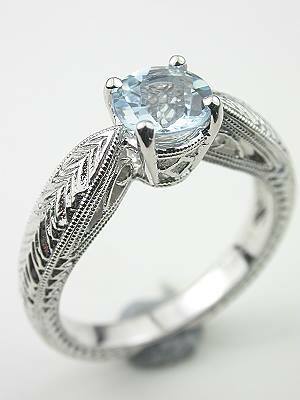 Channel set diamonds showcase a greenish blue aquamarine in this vintage engagement ring with fishtail setting. 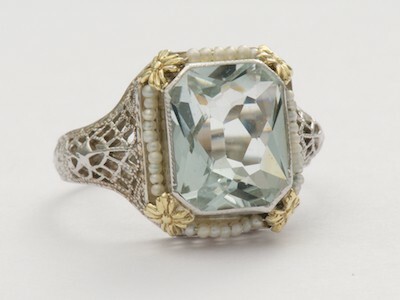 In this lovely vintage ring with fishtail basket is a round aquamarine that weighs 0.48 carats. A collection of six round single cut diamonds is channel set along the shoulders. Flanking the aquamarine, three on each side, and setting off its delicate sparkle, these diamond accents total 0.12 carats. The platinum band of this vintage engagement ring is polished to a smooth sheen. Circa 1940. 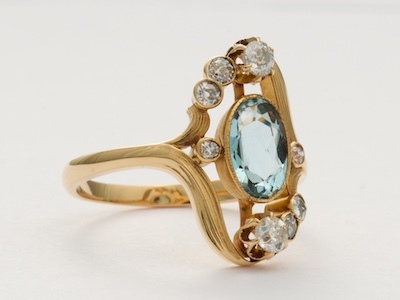 Immortalized in gold, the birds that call out from the shoulders of this aquamarine ring sing of love everlasting. According to legend, a bird call from the west is a harbinger of good luck while one from the east signifies the finding of true love.The avian motifs in this Edwardian ring bring the wearer prosperity and eternal endearment. An enchanting marquise cut aquamarine sits in the midst of their mating song. Details: Antique. Edwardian. Circa 1920. 14k yellow gold. Marquise cut aquamarine; 1.6 carats. A halo of diamonds surrounds an aquamarine in this romantic vintage style aquamarine engagement ring. This engagement ring is lovely from all angles starting with the diamond-studded, engraved shank to the curliques on the bottom and sides of the under bezel. 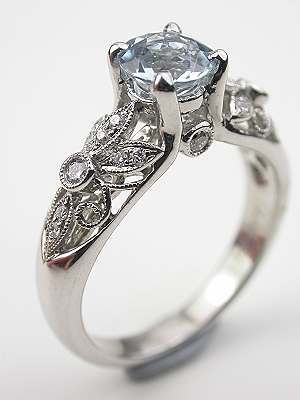 This is a vintage style (new) aquamarine engagement ring from the Topazery Collection. Streamers of luminosity pulsate from the center of this antique ring's beguiling aquamarine. When a meteor streaks across the sky, it emits pulses of illumination like the ones that surge down the shoulders of this Edwardian ring. The octagonal aquamarine in the center of this celestial display is set vertically, producing an elongation effect on the finger. A pierced filigree underbelly supports the gemstone. Details: Antique. Edwardian. Circa 1920. 14k white gold. Octagonal aquamarine; 1.83 carats. 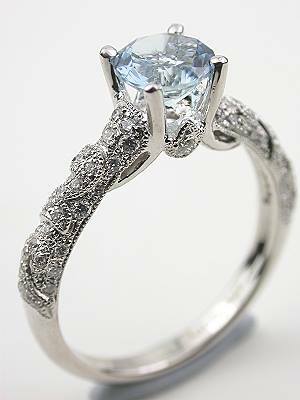 Likes snow flurries dancing in the winter wind, this aquamarine engagement ring has a swirling design. The engagement ring's 18k white gold band is intricately carved in filigreed chevrons and paisley swirls. The piece de resistance is the greenish blue aquamarine at the top. This centerpiece gemstone is flanked at the shoulders by a pair of triangular-set round brilliant cut diamonds. The total diamond weight of this engagement ring is 0.05 carats. 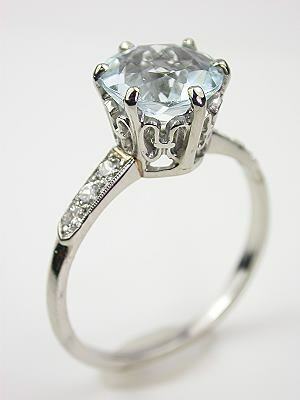 This is a (new) vintage style aquamarine engagement ring. 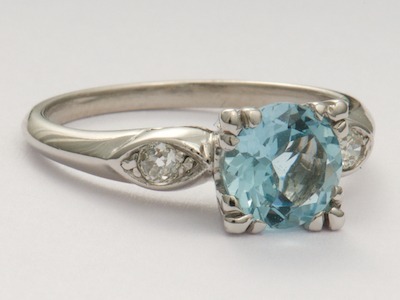 A round aquamarine gemstone emerges from diamond leaves in this antique style aquamarine engagement ring. The 18k white gold band of this aquamarine engagement ring is cut in a pierced scroll and leaf design which lends a touch of airiness to the finger. The scroll and leaf elements are accented with round full cut diamonds. This is a new antique style engagement ring. A diamond orbit spins around this antique Art Deco ring's aquamarine planet. The planet Uranus glows with the same light blue-green intensity as this antique ring's focal point cushion cut aquamarine. A constellation of bead set diamond stars spin around the centerpiece gemstone in a platinum setting. 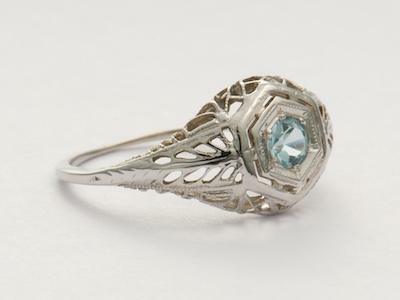 This Art Deco aquamarine ring has a pierced and hand engraved mounting. Details: Antique, Art Deco. Circa 1925. Platinum. Old style full cut and round brilliant cut diamonds; 0.80 carats. Cushion cut aquamarine; 5.67 carats. 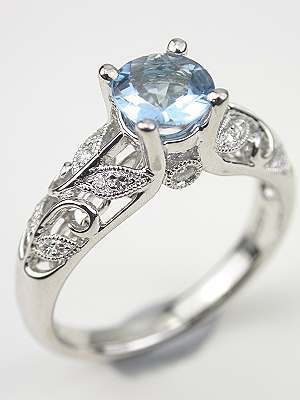 Climbing vines and leaves wind their way up the shank of this vintage inspired aquamarine engagement ring. The 18k white gold band of this nature inspired ring romantically wraps the finger in a floral and leaf pattern. This is a vintage inspired (new) engagement ring. 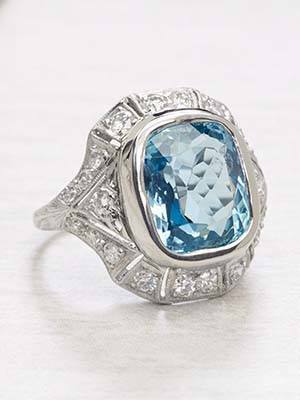 This antique aquamarine ring captures the bold and daring spirit of the 1920s. 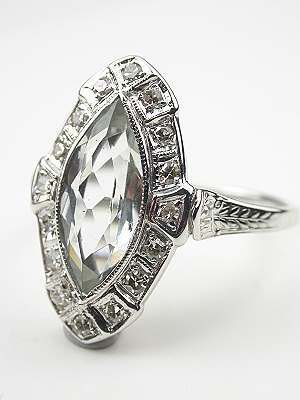 The elongated teardrop setting of this Art Deco antique ring shows off a marquise cut aquamarine. A collection of fourteen round single cut diamonds surround the centerpiece gemstone. They have a combined diamond weight of 0.18 carats. A 14k white gold band provides a tonal backsplash for the dramatic milgrain-trimmed gemstone setting. The shoulders of the band are carved in a feathery design. 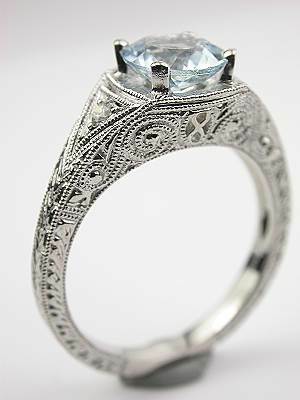 If you are looking for an unusual aquamarine engagement ring, this is antique art for the finger! Circa 1920. Blades of wheat point their way to a splash of blue in this aquamarine engagement ring. Constructed of 18k white gold, the band of this engagement ring is trimmed in milgrain and carved seven-eighths around in an angular wheat motif. A round aquamarine sits in the center of this nature-inspired ring. 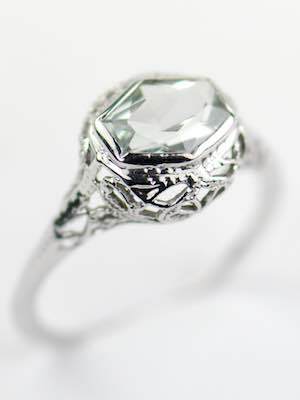 This antique style ring is perfect for the woman who prefers not to wear diamonds. 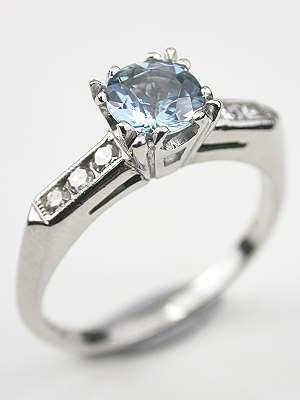 This is a new aquamarine engagement ring. The path not taken often leads to the most unexpected surprises, and this antique style engagement ring thrills from all directions. The 18k white gold band of this engagement ring is carved in a paisley filigree pattern along the shoulders where it is accented with thirty-four round full cut diamonds. This 0.16-carat collection of diamonds flanks a round faceted mixed cut aquamarine with a greenish blue hue. 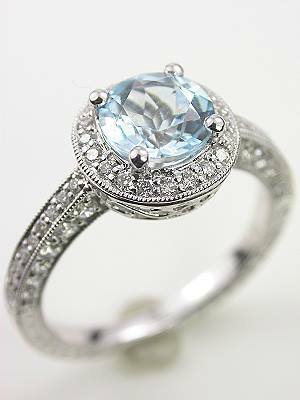 This is a new aquamarine engagement ring. 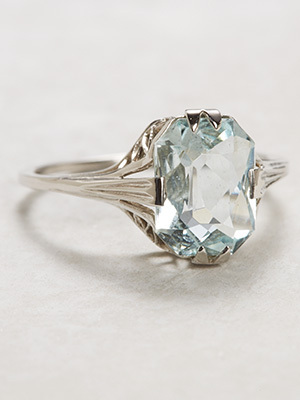 This antique engagement ring's hexagonal aquamarine rises from the center like a crystalline winter moon. The cool shimmer of white gold and aquamarine radiate from this Art Deco engagement ring. Looping bows add visual interest to the pierced and filigree mounting. The bezel set aquamarine that focal points this antique engagement ring rests horizontally in the midst of the fancy cutwork. Details: Antique. Circa 1920. 14k white gold. Hexagonal faceted mixed cut aquamarine; 1.2 carats. Ribbons of diamond lace wrap the shoulders and shank of this vintage style engagement ring. Round brilliant cut diamonds undulate down the 18k white gold band in glittering waves. Set at the center of all this sparkle is a round aquamarine. 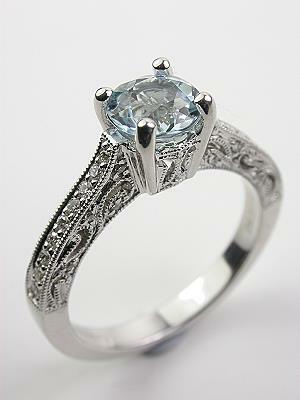 This is a new aquamarine engagement ring in the vintage style. 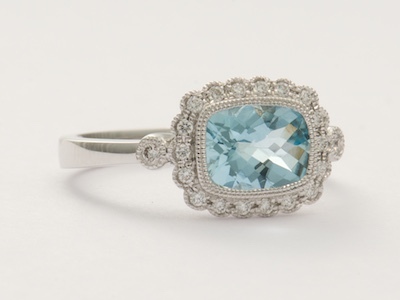 As you browse vintage and antique engagement rings, do you find yourself drawn to ones featuring aquamarines? You're not alone in your captivation. The allure of this gemstone dates back centuries. The word aquamarine is a combination of two Latin words: aqua, meaning "water," and marina, meaning "of the sea." 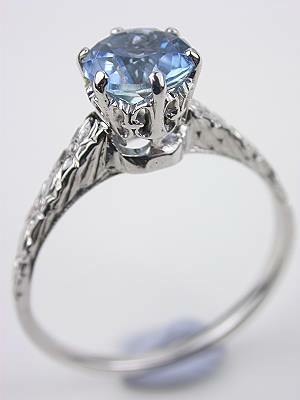 Legend has it the aquamarine was discovered in a mermaid's treasure chest, and had been blessed by the god of the sea. As far back as the second century, B.C.E., the aquamarine was thought to have healing properties, and was used to treat a variety of illnesses. Being far from home for extended periods of time, and perhaps holding tight to the mermaid legends associated with it, sailors adopted the aquamarine as their good luck charm. They believed it had the ability to protect them during long sea voyages, and that the stone's power could be increased by immersing it in sunlit water. Whatever channels travelers venture upon, it is believed they will meet clearly and openly when in possession of an aquamarine. Today, that belief extends to the realm of communication, meaning if you wear a vintage or antique aquamarine engagement ring, you and your partner may experience genuine, heartfelt communication, hence the long-held notion that the gemstone can heal fractured relationships. Even before the Romans came to appreciate the aquamarine, it was a prized gemstone in earlier civilizations. Several aquamarine stones have been discovered in Egyptian tombs. The Egyptians believed the aquamarine was a symbol of happiness, and could grant everlasting youth. Any bride who chooses an aquamarine engagement ring is selecting a small piece of history, and perhaps ensuring a happy married life. If you prefer a brand-new aquamarine engagement ring that evokes the feeling of a bygone era, one of our vintage or antique-style aquamarine engagement rings is perfect choices. If you love rings with a bit of history, our vintage and antique aquamarine rings from the Art Deco, Art Nouveau, Victorian, Edwardian, and Retro periods will appeal to you. We offer both solitaire and diamond-accented aquamarine rings with exciting details such as tiered and coiled bands, as well as a choice of precious metal settings. We carry aquamarine gemstones ranging in color from pastel blue-green to azure blue. Whether she adores understated and elegant, or bold and breathtaking, you'll find her perfect match in our aquamarine engagement ring collection.